Father and son composer-combinations are relatively rare in recent times, but there have been some famous examples: Johann Sebastian Bach and his sons, Carl Philipp Emanuel and Johann Christian, Johann Strauss I and II, Wolfgang Amadeus and his father Leopold Mozart, Domenico Scarlatti and his father Alessandro. Anthony was fortunate to have been exposed to numerous musical sources of inspiration when he was growing up with his family, and not just his father: his mother was a fine soprano who sang solos on many occasions, and his brothers and sisters all played and listened assiduously to music. Records of Beethoven, Shostakovich and Bartok jostled alongside the Beatles, Fiddler of the Roof and Dark Side of the Moon. 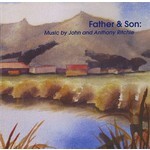 Anthony and his older brother Simon used to refer to the 1960s Kiwi Pacific Record of John Ritchie's Clarinet Concertino as simply "Dad's music". It was just one of many LPs in the house. However, in his teens Anthony became interested in writing down his piano improvisations, stealing quite a quantity of his father's manuscript paper in the process. Over the years, John quietly encouraged his son without ever pushing him into a career as a composer. He let him go his own way, while fostering Anthony's interest in East European composers, Bartok, Stravinsky and Shostakovich. There were never formal lessons, but a lot of sharing of information and opinions about music, and birthday presents that consisted of music scores. In more recent years Anthony has tried to repay the debt he owed by helping to stage performances and recording of his father's work. The Clarinet Sonata on this album, John Ritchie's last composition, is part of that repaid debt: the work was completed by Anthony when John's eyesight became too bad for him to work. Anthony was also very keen to include the Four Zhivago Songs (1977) on this recording (the first time it has appeared on CD), a work that he regards as one of his father's finest achievements. This album also represents an investigation into the violin, and its multi-faceted character. The Variations for G.B.P. and Thoughts from an Inner Garden were written around the same time as Anthony was working on a Violin Concerto. He feels very privileged to have been able to work closely with Tessa Petersen, and the other musicians, on this recording.